With a population of 4,261, Del Mar remains pedestrian-oriented and intimately scaled, a rustic village-in-the-woods best known for its world-class thoroughbred racetrack, county fair, shopping and restaurants. The affluent beachside hideaway of Del Mar is a small city of approximately 1.7 square miles running alongside two miles of coastline. As of the 2012 census, it had a population of 4,261 with a median age of 48.6 and an estimated median household income of $106,675. 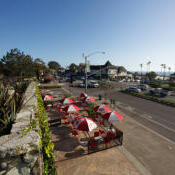 According to citydata.com, the most common industries for men residing in Del Mar are finance and insurance (23 percent) followed by professional, scientific and technical services (18 percent), which is also the second-most common industry for women (16 percent). The top industry for women living in Del Mar is in the area of health care and social assistance (19 percent). The most common occupations for men are top executives, and life and physical sciences. For women, top occupations are sales and business operations specialists. Just under 5,000 people reside in this affluent coastal town, which has a star-studded history dating back to Hollywood’s golden age. Several celebrities have called Del Mar home over the years, which is reflected today in the city’s street names and attractions. Every year, the population of Del Mar seems to explode, as visitors flock to the San Diego County Fair in the summer and following horse racing season.